I recently had the honor of joining Dunkin’ Donuts’ Executive Chef Stan Frankenthaler and Manager of Donut Excellence, Rick Golden, behinDD the scenes at the TODAY show as they contructed a three foot tall cake, made entirely of special TODAY Donuts and Munchkins donut hole treats. It was an incredibly fun experience and we’re excited to share some behind the scenes scoop with our “Behind the Beans” readers. 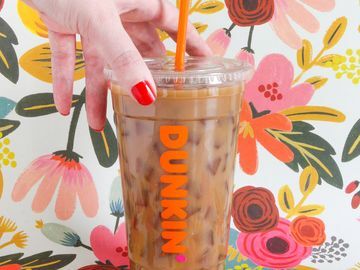 In order to celebrate TODAY’s 60th anniversary on January 13, Dunkin’ Donuts created a TODAY Donut, which was available from January 9 through January 15 in participating U.S. Dunkin’ Donuts restaurants. Rather than presenting the TODAY anchors with a few donuts, Dunkin’ Donuts’ Executive Chef Stan Frankenthaler and Manager of Donut Excellence, Rick Golden, had the great idea to create a grand cake out of TODAY Donuts and Munchkins donut hole treats. Though Stan and Rick had created donut cakes before, this one had to be extra special. 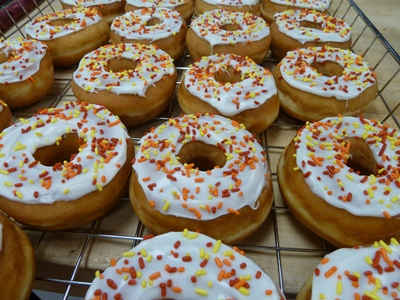 The TODAY Donut cake production started during the wee hours of the morning behind the scenes at the TODAY show. With dozens of donuts by their sides, Stan and Rick artfully stacked, angled and arranged TODAY donuts into the shape of a four-tiered cake. 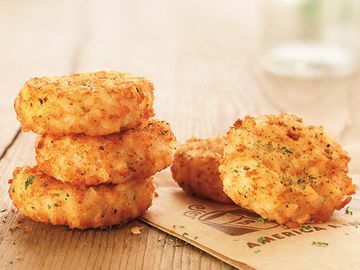 TODAY Donuts ReaDDy for Their Close-Up! Throughout the TODAY Donut cake making process, the fragrant aroma of donuts filled the kitchen space Stan and Rick were working in. The sight of donuts being stacked high atop the cake also attracted quite a bit of attention behind the scenes. We were thrilled to have so many crew members stop by to cheer on Stan and Rick and sample some of the delicious donuts and coffee we brought to keep the TODAY team running. 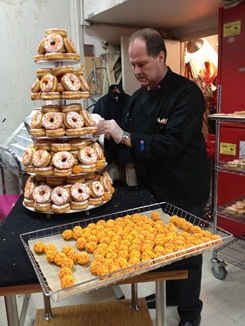 Rick Golden, Manager of Donut Excellence for Dunkin' Donuts, adds colorful Munchkins to the TODAY Donut Cake. After the donuts were stacked, Stan and Rick adorned the cake with special Munchkins donut hole treats created in the TODAY colors, red, orange and yellow. In total, the three foot TODAY Donut cake had 207 TODAY Donuts and 80 Munchkins donut hole treats! Once the TODAY Donut Cake was completed, the Dunkin’ Donuts team relished the moment as the cake was wheeled out onto the plaza. We watched heads turn on the street and were cheered on by the crowd on the TODAY show plaza. 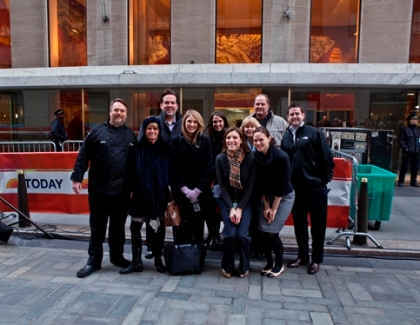 Then came the big moment when Executive Chef Stan Frankenthaler presented the cake to the TODAY anchors – Ann, Matt, Natalie and Al, which you can view here. To go behinDD the scenes and learn about how the TODAY Donut was made, check out this great video! 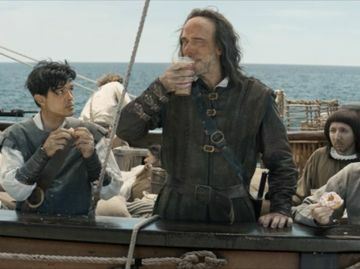 The Dunkin' Donuts and NBC Universal Team Cheering Stan and Rick on behinDD the scenes! Photo Credit: Anthony Quintano - NBC News. All in all, we had so much fun at TODAY. 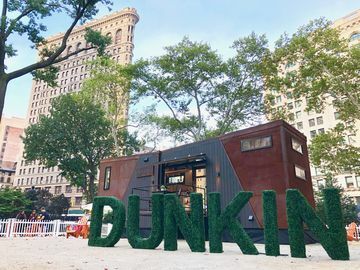 Dunkin’ Donuts was honored to be there as TODAY kicked off the week long celebration of their 60th anniversary and we would like to thank the TODAY team for all of their help!